NOTE: The four 10-32 Allen screws for the mounting clamp are not tight! Place bike on work stand or lift, in a well lit work area. For RT models only, it is necessary to remove all of the bodywork surrounding the engine. There are a lot of screws holding the body work on, be methodical and patient, making sure that all the screws are removed before you try to remove each piece of bodywork. Start at the top using the T25 Torx driver and remove the center tank trim, then the upper fairing panels on both the right and left sides. Remove the two black Torx screws that secure the glove box lid and remove glove box lid. Now remove all the screws holding the lower fairing panels , the two Torx screws nearest to the exhaust pipe will require the T30 Torx driver. When all of the screws are removed, gently pull the body work off paying attention to the locating tabs and other obstructions as you go. Once the body work is removed, installation is the same for all R1200 models. For all R 1200 models, install one side and tighten before going on to the other side. Loosen and remove the M12x50 Torx screw securing the rear frame to the engine crankcase, using the T55 Torx socket and breaker bar. Fit the rear mounting tube of the Highway Peg into the frame tube and reinstall the M12x 50 Torx screw loosely to hold it into place. Fit the M10x70 Allen screw through the front slot in the Highway Peg, through the spacer and into the M10 threaded hole in the side of the crankcase. Lightly snug up both the M10 Allen screw and the M12 Torx screw, making sure that everything is tightening properly and not interfering with any thing else. The front mounting bolt hole is slotted to allow some up and down adjustment in insure clearance for body work and valve cover guards. If you are installing on an RT, try to refit the lower fairing panel and make sure that you have clearance for the bodywork, it will be close, but it should fit. When you are satisfied that everything is in its proper location, remove one bolt at a time, and using the Blue Loctite retighten each bolt to the proper torque setting. Repeat this process for opposite side. For RT installations you may now replace the bodywork in the opposite order that it was removed. Take your time and be methodical refitting the lower fairing panels, it is easier to slide them over the Highway Pegs if they are in the extended position. 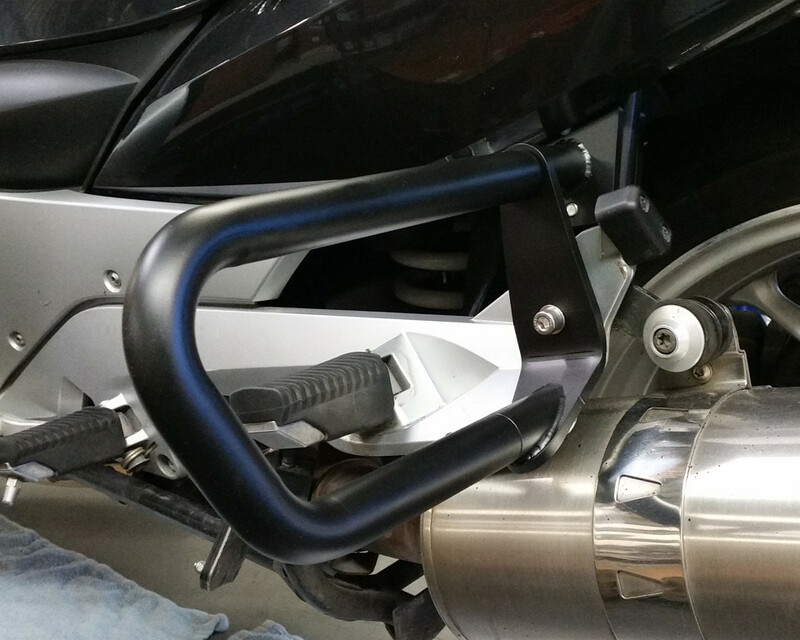 Now that the Highway Pegs are installed, it is time to adjust them for length. First, using the supplied 5/32 Allen wrench, loosen all four 10-32 Allen screws in the mounting clamp enough that you can move the rear clamp back far enough to disengage the locating pin from the rear of the adjustment tube. There are locating holes on ½” centers along the back side of the adjustment tube, slide the peg assembly forwards or backwards into the desired position, and making sure that the locating pin is properly seated in the desired adjustment hole, snug all four 10-32 Allen screws evenly. 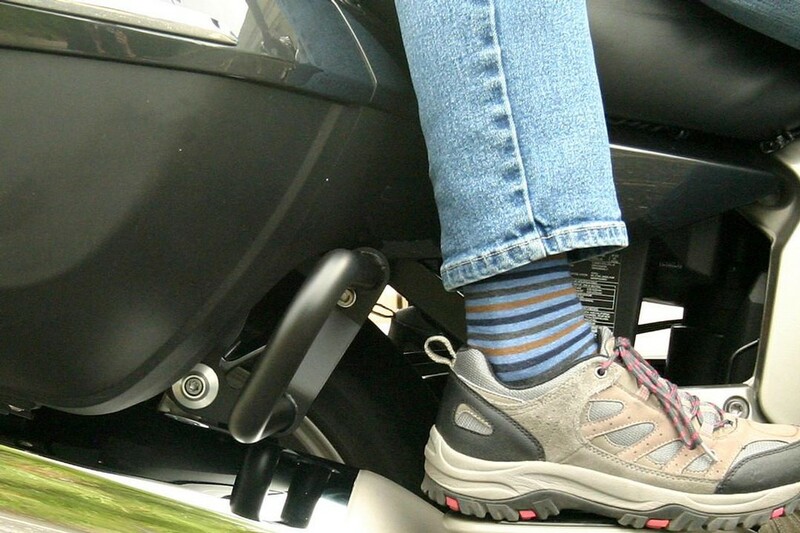 Sit on the bike and insure that the fore and aft adjustment in correct and comfortable. When you have determined that it is correct, remove one screw at a time, apply Blue Loctite and retighten to the appropriate torque. 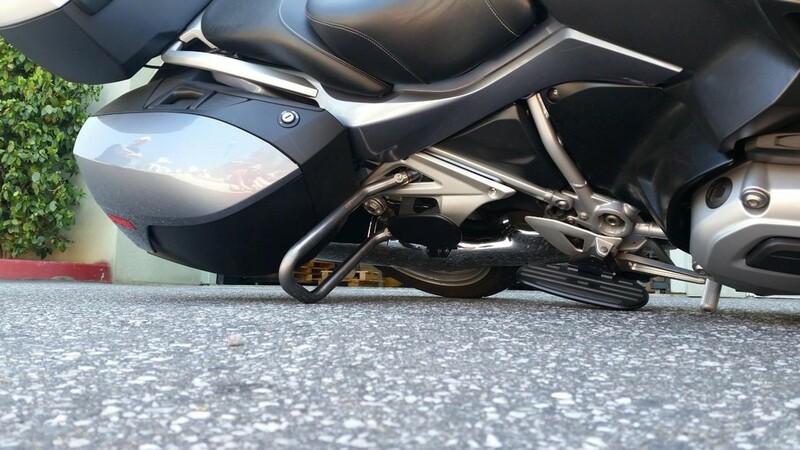 Insure that all of the motorcycle’s controls are operating properly and without interference, after riding approximately 100 miles, recheck all bolts and screws for tightness.